It is obvious that the incubation also depends on the size of the egg and species. Incubation time vary between 32 till 68 days. The larger the egg, the longer a penguin has to sit on it. The males of the emperor penguins have to sit more than two months before the egg hatch and the females return. When a female returns late from sea, the male even has to feed the chick, although he hasn't eaten for months. Not until the female has returned or their instinct tells them they have to leave for saving their own life, the males will walk back the whole way to sea (luckily not so far as when they came, because in the meanwhile spring began and a lot of ice has melt). Emperor penguins are the only species where the males do the entire breeding. Among the other species, both sexes alternate. The male always takes the first "shift" and depending on the species, the female takes over after 1 till 14 days. Afterwards they alternate often, with one looking after the eggs and/or chicks, while the other is eating on sea. 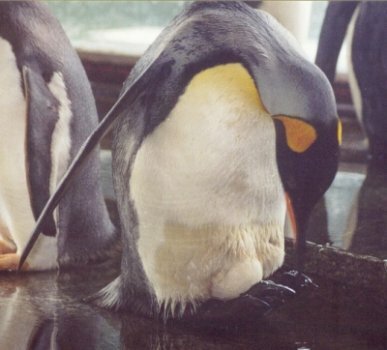 When a partner doesn't return in time, the breeding penguin remains at least three weeks, until his/her instinct forces him/her to leave for surviving. Then the eggs or chicks become a prey to the enemies. The development in the egg is the same as for all other birds, although the timespace depends on the species. Once a chick is developped completely, it needs about one day to break through the eggshell with the special hatching spine (egg tooth). From that day on, they entirely depend on their parents, because the first days they have no waterproof feathers to protect them against cold and water.